When a friend of mine found out I’m writing a magazine piece on offal in the Maritimes, he said, “You have to meet Jesse Vergen.” Well, last week I had the chance to eat at the Saint John Ale House, where Vergen is the executive chef, and my oh my, was it ever something. I don’t want to poach too much from my piece, but it’s fair to say that I know my offal. I’ve worked with most pieces of most eaten animals, which has included boiling a pig’s head for headcheese, sautéing lamb kidneys, grinding chicken livers, peeling a cow tongue, pressing veal sweetbreads and searing succulent little duck hearts. One thing that is for sure: it’s a tricky to make a tough, iron-tasting or super-gelatinous piece of organ, trotter or cartilage taste delicious. So when it comes to eating it, it’s good to have low expectations. But from the moment this array of charcuterie arrived, we had a feeling something magical was about to happen. On it was house-made cured hog’s snout, beef heart tartare, porchetta di testa (rolled pig’s head), pancetta, smoked mackerel with potato and mackerel aoli, pancetta, duck prosciutto, and a pig skin bruschetta (yes, you read that correctly) done in a Sicilian style with capers, olives and tomato concasse. And that was just the proteins. Garniture included crostini, pickled red onions, carrots, cucumbers and eggs quick-pickled in beet vinegar. Phew, right? It was so extensive it was hard to know where to start. But from our first bite of beef heart tartare (which was divine) it was clear that Vergen not only knows what he’s doing, but that he seriously respects his ingredients and knows how to work with offal. The other magical thing with offal is what it can do for food costs in a kitchen. In fact, the crazy-sounding pig skin bruschetta was an exercise in improvisation from Vergen, who challenged one of his cooks to play with the often-discarded skin right before the platter came out. While the final result was a bit soggy, the idea behind the attempt was admirable. The lip-smacking gelatinous effect of the braised skin, cut with the astringency of capers and acid and served on grilled bread, was pretty delicious and certainly unexpected. Most importantly, that plate helped to make a point, a point I’ll write about in Saltscapes in more detail, but one that I think goes thusly: in trying to eat local meat, in trying to eat sustainably, chefs have to be creative, they have to be smart, and they have to let the ingredients lead. 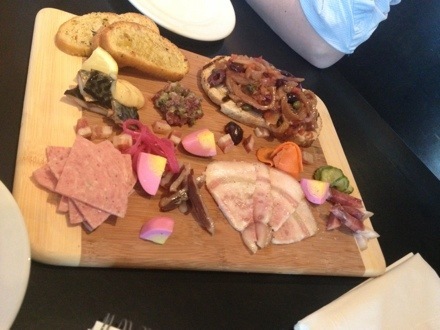 Every item on that charcuterie plate was made with the above in mind, and perhaps more importantly, with love. It was obvious. A brief tangent away from offal: this plate of smoked sturgeon arrived near the end of the meal, and at this point I was convinced Vegen was just showing off. Apparently the locally-raised fish came from an event he recently catered, and it sat on a bed of fermented cabbage with a garnish of green apple julienne. It was beautiful, precise and original. 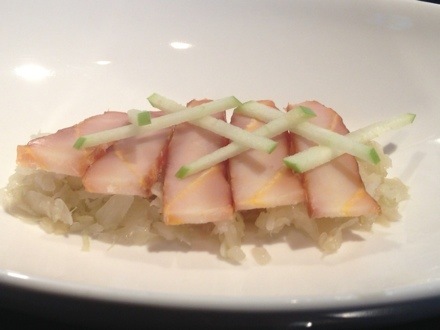 Smoked New Brunswick sturgeon with sauerkraut and green apple julienne. I hope Mr. Vergen is aware of how high he has set the bar for himself. Or maybe that’s the point. I friggin love offal done right. This post reminds me of the time Johnathon Strebly, myself a few other Foodists had the chef at Pied-à-Terre in Vancouver create an entire meal of offal for us. It was unforgettable. We really should start planning The Offal Dinner 2!